…I’m going to go ahead and “squee” over an email I got yesterday. Apparently my short story “Thirty Nine” has received an “honorable mention” for the 3rd quarter of the Writers of the Future Contest. 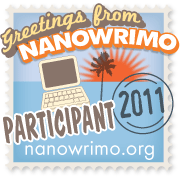 Now, the story will not be published but I will be getting a shiny certificate in the mail and a mention on their blog. Not a bad little ego boost. I’ve been in a writerly funk of late and this helps a bit. I’ll be sure and post my certificate when I get it in my hot little hands. This entry was posted in Announcements and News and tagged contest, fiction, sci-fi, short stories, writers of the future, writing. Bookmark the permalink. Thank you! I can’t post the story on the website because I’m still trying to sell it–and if I post it on the website it is counted as “previously published” and therefore harder to sell. I’ll have to bring you or send you a copy of the draft.